In 1682, Henri de Tonti established a trading post known as Postede Arkansea at the Quapaw village of Osotuoy. It was the first semi-permanent French settlement in the lower Mississippi River Valley. By 1819, the post was a thriving river port important enough to be selected the capital of the Arkansas Territory. In 1862, Confederate troops constructed an earthen fortification known as Fort Hindman. In January, 1863, Union troops destroyed the fort and adjacent river port town, ensuring control of the Arkansas River. By mid-1862, Union gunboats commanded most of the Mississippi River. When the gunboats went up the White River into the heart of Arkansas, the Confederates began to prepare defenses on the Arkansas River, an important water route to the capitol at Little Rock. Before the end of 1862, Confederate General Thomas J. Churchill completed an earthen fortification at Arkansas Post called Fort Hindman, or the Post of Arkansas. The battle took place on January 10, 1863, when Union forces under Generals John McClernand and W.T. Sherman captured the fort. While the remains of Fort Hindman now lie underneath the channel of the Arkansas River, there are still remnants of the Confederate trenches. Peak visitation occurs in April and May. Visitor Center: Daily: 8 a.m. to 5 p.m.
Trails; museum; gift shop; information; rest rooms; handicapped access. Directions: Arkansas Post National Memorial, located in east-central Arkansas, is considered part of the Arkansas Delta region. The entrance to the park is on Arkansas state road 169, nine miles south of Gillett, via U.S. 165 (The Great River Road), and about 17 miles northeast of Dumas, via U.S. 165. In the West, Ulysses Grant, whose victories at Fort Henry, Fort Donelson, and Shiloh in 1862 had vaulted him into prominence, now found himself bogged down in his campaign against the Confederate Mississippi River stronghold at Vicksburg. In late December of 1862, William Tecumseh Sherman, later to become notorious in the South for his march through Georgia and South Carolina, had been repulsed with heavy losses at Chickasaw Bluffs north of Vicksburg and forced to withdraw. Southerners had reason to hope that the fledgling Confederacy, despite the Northern preponderance of men and material, might yet win its independence. In Arkansas, however, the situation was not so promising. In 1862, Federal forces had won battles at Pea Ridge and Prairie Grove in northwest Arkansas and had occupied the port city of Helena on the Mississippi River. The victories at Pea Ridge and Prairie Grove had helped secure the state of Missouri for the Union, but they did not guarantee Federal occupation of the remainder of Arkansas. Before that could be accomplished, Union forces would have to gain control of the Mississippi River, which forms the state's eastern border, and the Arkansas River, which bisects it from northwest to southeast., As remnants of Thomas Hindman's defeated and demoralized army struggled toward Little Rock in late December 1862, Federal commanders were preparing to do just that. The first blow would fall at a place already steeped in the state's history - Arkansas Post. Since its founding by a party of Frenchmen under Henri de Tonti in 1686, the location of Arkansas Post had changed several times. Historians have identified at least ten different forts and settlements associated with the Post. In this pivotal year in the history of Arkansas and the nation, it was, in the words of a Union officer, "a small village, the capital of Arkansas County... situated on elevated ground, above the reach of floods, and defining for some miles the left bank of the river. [It] is 50 miles [sic] above the mouth of the river, 17 miles below Little Rock, and is surrounded by a fruitful country, abounding in cattle, corn and cotton." As the year 1863 opened, the fate of Arkansas Post and the rest of the state had been entrusted to Lt. Gen. Theophilus H. Holmes, a fifty-eight-year-old North Carolinian and West Point graduate who had served with distinction in the Mexican War. Holmes's Civil War service, however, was marred by criticism and controversy. Plagued by poor health and seemingly unequal to the responsibilities that had been assigned to him, he was held in low esteem by the men under his command, who gave him the unflattering nickname "Granny." One critical newspaper editor summed up the feelings of many about Holmes when he concluded a scathing indictment by noting, "In justice, we must add that Gen. Holmes is a man of most excellent heart, kind disposition and a gentleman in all things, and it is not his fault that he is not a General." For all his shortcomings, Holmes did understand the importance of defending the river approach to Little Rock. He placed Col. John W Dunnington in charge of the river's defense, and, in late 1862, Dunnington began the construction of an earthen fort at Arkansas Post. The site selected was on high ground at the head of a horseshoe bend. By the middle of November, the fort, known alternately as the Post of Arkansas or Fort Hindman, was nearing completion. Diamond-shaped, three hundred feet on a side, and armed with three heavy cannon and eight smaller cannon, the fort commanded an unobstructed view of the river for more than a mile in either direction. A line of rifle pits extended westward from the fort for almost a mile to a stream called Post Bayou. The garrison was made up of approximately five thousand troops from Arkansas, Texas, and Louisiana, many of them dismounted cavalry. In December 1862, Holmes sent Brig. Gen. Thomas Churchill to take command of the post. Churchill, a Kentuckian and Mexican War veteran, was married to Anne Sevier, the daughter of a prominent Arkansas family. He had fought at Wilson's Creek (Missouri), Pea Ridge, and Richmond (Kentucky) before coming to Arkansas Post. Churchill was determined to use his new command not only as a defensive position, but also as a staging area for strikes against Federal communication and supply lines on the Mississippi River. Accordingly, in the last week of December 1862, Confederate forces operating out of the Post attacked and captured the unarmed Union steamer Blue Wing at Cypress Bend on the Mississippi, eight miles below the town of Napoleon. 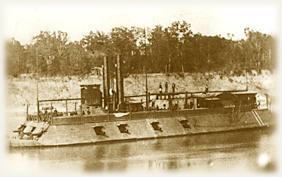 The Blue Wing, carrying ordnance and supplies and towing two barges of coal, was destined for the Federal fleet downriver at Vicksburg. The victorious Rebels towed the ship and its supplies up the Arkansas River to the recently completed Fort Hindman. This Confederate triumph would turn out to be the beginning of the end for the Post of Arkansas. On January 4, 1863, Grant placed Maj. Gen. John McClernand in command of Union forces that were attempting to regain control of the Mississippi River. McClernand, a former Illinois congressman who owed his position to President Lincoln's desire to hold southern Illinois Democrats to the Union cause, was despised by regular army men, and he knew it, but he was determined to make the most of his opportunity. After concluding that future operations against Vicksburg were threatened by the continued presence of Rebel forces at Arkansas Post, he determined to attack and destroy it. William Tecumseh Sherman, fresh from his defeat at Chickasaw Bluffs and now in McClernand's command, concurred. On the night of January 4, Sherman and McClernand conferred with Adm. David D. Porter, chief of river operations, on board Porter's headquarters boat, the Black Hawk, to develop plans for the attack . On January 8, McClernand loaded thirty-two thousand infantry, one thousand cavalry, and more than forty pieces of artillery aboard sixty transports. Escorted by three ironclads and several other rams and gunboats, the Federal flotilla headed upriver from Milliken's Bend near Vicksburg. In an attempt to mask his intentions, McClernand directed that the force continue upriver past the mouth of the Arkansas to the mouth of the White River. The flotilla proceeded up the White and thence through a cut-off to the Arkansas, where it turned upriver toward Fort Hindman. At 5 p.m. on the ninth of January, the troops began disembarking on the left bank of the river at Nortrebe's farm, approximately three miles below the fort. By noon on the tenth, all troops had been landed. In addition, two regiments of infantry, one of cavalry, and three pieces of artillery were landed on the right bank of the river with instructions to gain a position above the fort from which they could control the upriver approaches. Churchill ordered his whole force, which he reported as "3,000 effective men," to take positions in trenches about one-and-a-half miles below the fort to block the direct line of advance along the river between Nortrebe's farm and Fort Hindman. But enfilading fire from the gunboats Rattler and Black Hawk forced the Confederates to withdraw to the fort and adjoining positions. Defective powder limited the range of Fort Hindman's big guns preventing them from effectively challenging the gunboats. McClernand planned to move his troops into position on a plateau north of the fort. To divert attention from this movement, he ordered Porter to move his gunboats upriver to engage Fort Hindman's guns. Shortly after 5:30 p.m., Porter sent the ironclads Louisville, Baron de Kalb, and Cincinnati upriver to within four hundred yards of the fort. As soon as these became engaged, Porter also sent the light draft vessels Lexington and Black Hawk to throw in shrapnel and rifled shell. Finally, he ordered the Rattler to steam past the fort and enfilade it. A fierce duel ensued in which the Rattler sustained severe damage from Confederate guns and drifted back into an abatis that Dunnington had placed in the river opposite the Post. The fight continued until after dark, when superior Union firepower finally succeeded in silencing most of the fort's guns. McClernand continued to deploy his troops throughout the evening of the tenth. Churchill was also busy positioning his troops in the rifle pits extending west from the fort to Post Bayou.,, During the night, he received a telegraphic dispatch from General Holmes ordering him to "hold out till help arrived or all dead." Churchill passed the word on to his brigade commanders with instructions to see it carried out "in spirit and letter." A Texas cavalryman scoffed, "When it comes to our number holding out . . . against such odds it is all bosh, and if 'GRANNY' Holmes was down here where he could smell a little gunpowder, he would get better of the 'hold on' fit which so recently seized him at LITTLE ROCK." McClernand recorded that the night was cold and his troops without fires and tents, but on the morning of January 11, his "chilled but faithful men were greeted by a bright and genial sun." His plan called for Porter's gunboats to begin a thirty-minute shelling of the Rebel positions at 1 p.m. This would be followed by a three-minute lull, and then the full-scale assault would begin. Porter's barrage began as scheduled. On the Union right, Sherman, whose troops were in position approximately four hundred yards from the Confederate lines, noticed that the Rebel artillery quickly ceased to respond to the fire. He ordered his troops forward before the specified time had passed. Soon the entire Federal line was in motion. With Fort Hindman's big guns silenced, Porter's gunboats moved in, pounding the fort from close range and lobbing exploding shells over the walls. "Oh what a grand sight. FORTY THOUSAND men pressing forward as one man, all silent except the commands of the Officers, on, on they come like an irresistible thunder-bolt, as it dashes unrestrained through the air; to crush the atoms of the sturdiest Oak, or cleave the adamantine cliffs in twain. The Confederates remain as silent as spectators, every man with his finger on the trigger, and each gunner at his post, until the front line of the enemy are within seventy yards of our works; a blaze of fire flashed like lightning along our line, sending three thousand bullets into the Federal ranks, while at the same time [our remaining artillery] poured forth grape and canister; opening avenues of death through the lines of the advancing foe, their lines waver; halt; and fall back, but in good order, leaving the ground strewed with their dead and dying; They reform their lines for another assault." The Federals' overwhelming numerical superiority eventually began to prevail. The combination of Porter's guns and McClernand's field pieces knocked out all of Fort Hindman's guns except for one ten-pounder Parrott. Still, the Rebels resisted. By 3 p.m., Sherman's troops on the Union right were within a hundred yards of the Rebel lines, and on the left, some of the Federal soldiers had reached the ditch that surrounded the fort. As the Federals prepared for a final assault, white flags of surrender suddenly appeared along part of the Confederate line. No one was more surprised by the white flags than Churchill, since he alone had the authority to order a surrender and had not done so. He realized that holding on to the Post of Arkansas was impossible given the enemy's superiority in men and firepower, but he had hoped to be able to hang on until nightfall, when he would try to cut his way through the Union lines to safety. The appearance of the white flags made this impossible. Federal forces quickly crowded in on the area where the flags had appeared, making further resistance futile. Reluctantly, Churchill ordered the remainder of his command to lay down their arms. When Sherman entered the Rebel lines, he was immediately impressed by the extent of the damage inflicted by Union firepower. "I saw that our muskets and guns had done good execution," he wrote. "The fresh made parapet had been knocked down in many places, and dead men lay around very thick." W W Heartsill noted, "Only one gun of Hart's Battery but what is dismounted, all his horses; eighty-three in number are killed in their harness." It was, he added, "as fierce an engagement of six hours as has occurred during the war." The victory had not come cheaply for the Northern army, either. McClernand's final report listed 134 killed, 898 wounded, and 29 captured or missing for a total of 1,061 casualties. Porter reported 30 killed or wounded. Churchill listed Confederate casualties as 60 killed and 75 to 80 wounded. The remainder of the Confederate command, numbering 4,793 men, was taken prisoner. In addition the Federals captured 3,000 stands of small arms, 40 cans of powder, over 2,000 rounds of artillery ammunition, 46,000 rounds of small arms ammunition, 563 draft animals, and a considerable quantity of commissary and quartermaster stores. Part of the captured ammunition came from the Blue Wing. The Rebel prisoners were sent by steamer to the commissioner of exchange in St. Louis. McClernand ordered the destruction of Fort Hindman, and, on January 17, he re-embarked his command and steamed back to Milliken's Bend to participate in the campaign against Vicksburg. The triumph at Arkansas Post would be McClernand's last hurrah as an operational commander. Resentment over the political nature of his appointment and his own overbearing personality soon resulted in his reduction to a corps commander under Grant. For Arkansas's Confederates, the loss of Arkansas Post was another major setback. Its fall opened the river approach to Little Rock from the Mississippi and was a severe blow to morale. A Little Rock editor wrote on January 17, "The present is a dark day in the history of our State.... The taking of the Post is an unexpected blow to our people, and one which will be felt throughout our length and breadth, as it is the removal of the only impediment offered in our river ... to the approaches of the gunboats."